The Toronto Maple Leafs and their hordes of fans turned up at the KeyBank Center on Thursday night. Not only did the Leafs outscore the Sabres, but their boosters outcheered the home fans along the way. It’s been one of those seasons for the locals. The second and final appearance of the Leafs here isn’t a bad time for comparison of the two franchises. You might remember – actually, it’s tough to forget – that the Sabres were in last place in the overall standings in 2013-14 and 2014-15. Then a year later, it was Toronto’s turn to fall to the basement of the league. So where are we almost two years after that? The Maple Leafs have rebuild their franchise nicely. Toronto moved to 42-22-7, for 91 points on the season with Thursday’s win. They have a decent shot at 100, which would be quite an achievement. Meanwhile, the Sabres dropped to 22-36-12 for 56 points. They sank a little deeper into the basement of the NHL standings, and have a chance at finishing last overall for the third time in five years. That hasn’t been done since the Ottawa Senators first entered the NHL in the 1990s. The two major pieces of the teams’ rebuilding efforts were again on the sidelines, as Auston Matthews of the Maple Leafs and Jack Eichel of the Sabres were still hurt. If you had to pick out one difference between the teams based on Thursday’s game alone – admittedly not the fairest of standards – the difference in team speed jumped out. Toronto was pushing the puck from one end of the ice to the other, either by long passes or quick skating. Whoosh. 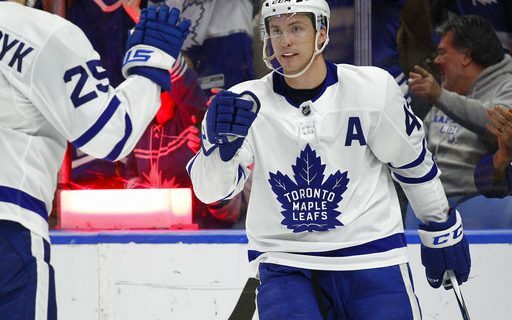 The score probably could have been 4-0 before 15 minutes had gone by, as the Leafs did a passable imitation of the 1985 Edmonton Oilers – relatively speaking. Toronto got a little lucky on the first goal, as James van Riemsdyk threw a puck on goal from behind the end line and it went past a stick-less Robin Lehner. The second goal was more typical, as van Riemsdyk was allowed to skate down the slot unimpeded. He beat Lehner with a perfect shot to the top corner, and it was 2-0 with less than seven minutes gone. The Sabres eventually got their legs under them. If you listen to them, it was because Nathan Beaulieu got into a fight with Toronto’s Matt Martin. That was a relatively common tactic 20 years ago, but it’s gotten a little out of fashion since then. No doubt Rob Ray was smiling when watching this fistic matchup. Whether it was a fight or a penalty call on the Maple Leafs three seconds later, the Sabres were ready for the ensuing power play. Sam Reinhart got Buffalo on the scoreboard with a tap-in from in close. The Sabres thus survived a first period that saw them give up 19 shots. But in the second period, the Maple Leafs turned the game back in their direction. They killed off an early penalty. Then Connor Carrick carried the puck along the inside of the blue line, shot when he reached center ice, and found the net to make it a 3-1 game. “That third goal was a killer for us,” Housley said. Tyler Bozak added another goal for Toronto on the power play. Buffalo’s only response came with the extra man, as Jason Pominville tipped home a shot by Rasmus Ristolainen. The Maple Leafs did a good job of keeping the Sabres quiet throughout the third period, adding an empty-netter to send the Leafs’ portion of the sellout crowd happy. “In this league, when you get down by a couple against a good team, it’s tough to fight your way back,” Housley said. Chicago hasn’t been a good team this season (last in the Central Division), so we’ll see how the Sabres fare against the Blackhawks. It’s another Saturday afternoon game.